Ant-Man, the latest addition to the Marvel Cinematic Universe, began shooting in San Francisco today. The film stars Paul Rudd as the title hero, a con-man named Scott Lang who dons a super suit that allows him to shrink in size but increase in strength. With the help of his mentor and creator of the suit, Dr. Hank Pym (Michael Douglas), Ant-Man takes on a series of threats and becomes involved in a heist that could save the world. The film will also star Evangeline Lilly as Hank Pym's daughter Hope Van Dyne and Corey Stall as Ant-Man's nemesis Darren Cross, aka Yellowjacket. Ant-Man is being directed by Peyton Reed. Other cast members include Bobby Cannavale, Michael Pena, Abby Ryder Fortson, Judy Greer, David Dastmalchian, Wood Harris, John Slattery, Gregg Turkington and T.I. 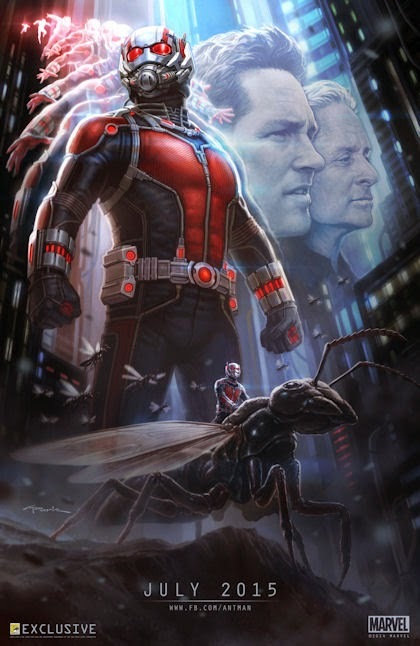 Ant-Man will also shoot on-location in Atlanta, where the production is based. The film is scheduled for release in the U.S. on July 17, 2015. Other Marvel films scheduled for upcoming release are Avengers: Age of Ultron on May 1, 2015, Captain America 3 on May 6, 2016 and Guardians of the Galaxy 2 on July 28, 2017.